The Dragon Fan is the perfect fan for performing Snowstorms and Butterfly Blizzards. 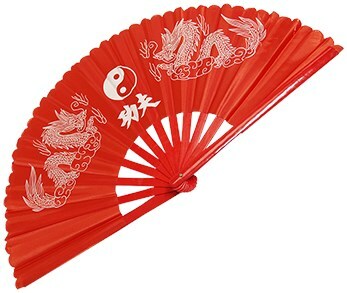 The fan is made out of high-grade, bright red lacquered bamboo; The classic martial art motif of double dragon printed icons are on the screen. The fan spans a wide 24" x 12" high when fully opened for generating maximum air current.